Completed in 2002, the Burnett Honors College was designed for the express purpose of providing for the educational needs of students and their faculty. Given state of the art equipment, it strikes an exquisite balance of comfort and style, creating an atmosphere where students can learn within comfort. 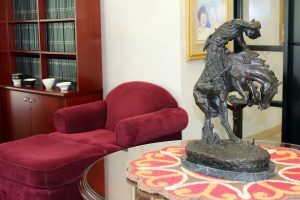 Within its 10,250 square-foot interior are housed multiple classrooms, faculty offices, a computer lab, and even a reading room designated for studying. The honors college houses 5 small classrooms with class sizes capped at 20 students, with the exception of English writing capped at 15 students. These classrooms are not just for Honors classes though, we also house graduate classes and others as well. Each classroom also contains a variety of student art work. Faculty are aided by the multi-media equipment within the classrooms as well, including projectors, touch screens, wireless mice, VCR, CD-R, LCD flat panel touch screens, full audio, and a DVD player. All of the classrooms also provide wireless Internet connections and now support recording video presentations straight to a USB drive. For instructions, click here. Have you ever walked through The Burnett Honors College garden? Maybe you sat down there for a relaxing lunch or just took a seat to take in all its beauty? The garden was designed for relaxation and quiet meditation. 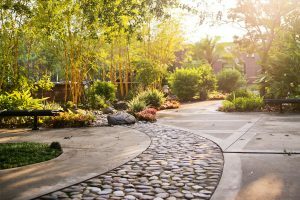 Over the past decade the garden has undertaken a few different face lifts culminating in what is now more beautiful than we could have ever imagined! The garden also has a pond full of beautiful and colorful Koi fish making it a true oasis for our students. You may even find a professor teaching class. 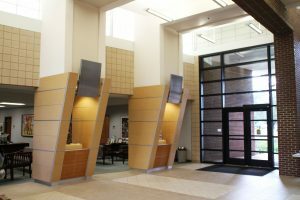 The central hub of the honors college, the lobby is marked by its large gallery of art and constant student activity. The offices of The Burnett Honors College house the Dean, Associate Dean, Directors, and all of the support staff that maintain the day-to-day operations of The Burnett Honors College. The Reading Room is the Honors College designated quiet study area for Honors students and houses all of our Honors in the Major Theses. It also includes a small kitchen with a mini refrigerator and microwave for student use, multiple couches and tables to ensure many students can work simultaneously, wireless Internet connection, the unabridged Oxford English Dictionary, and a Grandfather clock which was purchased by Dean Stearman and former Associate Dean Dr. Stuart Lilie to commemorate Honors becoming a college in 1998. 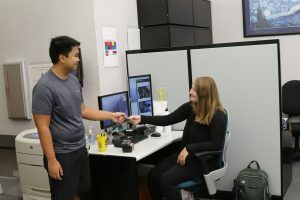 Honors students have exclusive use to two private computer labs on campus, one housed within the Honors College, and the other housed within Knights Plaza Tower III. Both hold computers that can only be used by students in the Burnett Honors program. In addition, all printing in both computer labs is completely free. 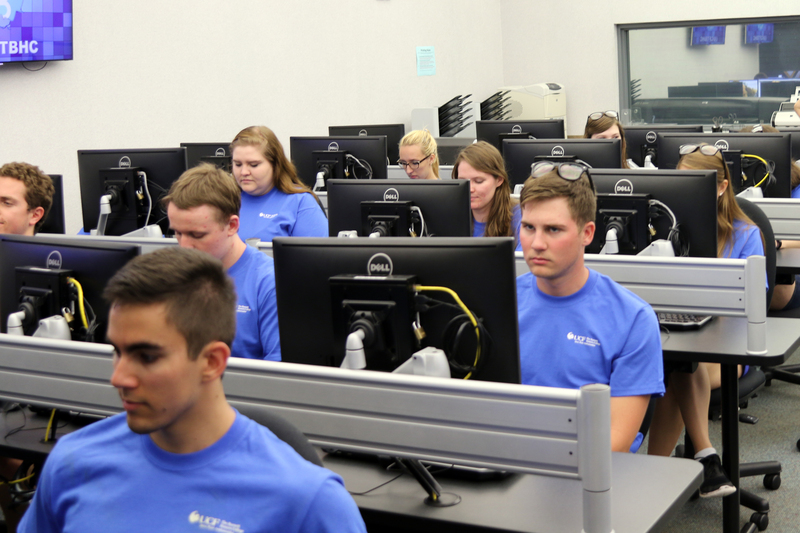 With the newest hardware and up-to-date software, these labs provide the perfect tools for student success. The Honors College Computer Lab contains 40 computers, a scanner, two Macs, and printers for grey scale and color. There is no better, no more reliable location on campus regarding access to a stable internet connection and printing services. Software programs include Minitab, SPSS statistical software, Office 2016 including proofing tools for over 50 languages, Math Cad, Photoshop, Illustrator, and InDesign. The Knights Plaza Tower III Computer Lab contains 18 computers, grey-scale and color printing, and internet access, all available 24/7. Software programs include Minitab, SPSS statistical software, Office 2016 including proofing tools for over 50 languages, Math Cad, Photoshop, Illustrator, and InDesign. 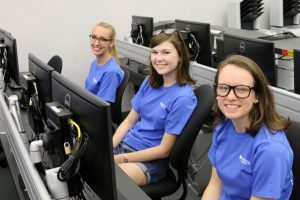 This computer lab is only available to the honors students living in Tower III. Campus Housing has designated Tower III at Golden Knights Plaza as The Honors Living-Learning Community. There are 250 beds available, which will house both new freshmen as well as returning Honors students. The layout is four single-occupancy bedrooms, sharing 2 bathrooms, a common living room, and a complete kitchen. The Towers are wired with Ethernet connections, so each student has a computer line. In addition, Tower III offers 11.5 month contracts, to allow students to make the most of their summers at UCF. 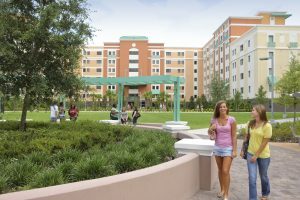 Students who are not able to house in The Honors Living-Learning Community will reside in other residence halls or off-campus.